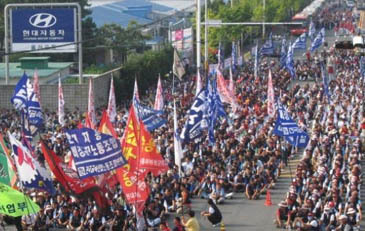 Thousands of Hyundai Motors workers striking at its Ulsan plant in Ulsan, South Gyeongsang Province Aug. 31, 2005. Workers at South Korean carmaker Kia Motors have downed tools, joining colleagues at Hyundai who are already on strike over pay and bonuses. Workers at Kia, which is 39% owned by Hyundai, voted to implement two stoppages during Monday's working time. Staff at Hyundai walked off the job for a third day on Monday, and more stoppages are planned for this week. Workers want better pay and improved conditions, as well as assurances about job security and future redundancies. Strikes are nothing new at Hyundai and Kia, and wage talks end in industrial action on an almost annual basis. Almost three-quarters of Kia's 27,000 union members voted in favour of the strike. The companies played down the impact of the strike action, with Kia spokesman Michael Choo saying that it was "business as usual." "We don't see a major impact" on long-term production, he added. Kia said the planned stoppages would knock output by 10,569 vehicles, costing more than 100bn won (£54m; $97m). Kia lost about 286bn won last year because of a 14-day walk out. Hyundai said that strike action last year cost it 263bn won. Unions are seeking an 8% rise in basic pay, shorter working hours and more say for staff in managerial decisions. Hyundai has said it cannot accept workers' demands because record oil prices had pushed up its costs at a time when foreign sales have been falling. Analysts have warned that poor labour relations may hinder Hyundai's plans to become one of the world's five largest carmakers.